She's back but absent regarding Maine citizens' needs. During her nine day trip abroad, Senator Collins avoided an opportunity to connect with us and figure out how to best serve her constituents with robust health care reform. Instead, as well illustrated, at Dirigo Blue, she is now getting her information and talking points directly from the insurance industry. Senator Collin's may be happy to be back in America but she is still absent in terms of caring for its citizens. We ought to keep up the pressure on both of our Senators but it is appearing more and more that doing so will just be an expression of dissatisfaction in the case of Senator Collins and a slim prospect for a fair consideration of our health care needs lies with Senator Snowe. Collins has collected over $1,600,000.00 in campaign contributions ($300.00 per day) in her career to date from health, insurance, and pharmaceutical industries and has apparently decided to be their Senator, not Maine's. "…first step in destroying the best health care system the world has ever known." "The fact of the matter is that in order to pay for a trillion dollar-plus bill, or even if they can get it down to just $900 billion, it's going to come from us,"
”We're for it but we also don't want to have a government takeover of the health care system, which is the foot in the door which would be led to, and second of all, we don't want any employer mandates”. “The American people will not stand for rationed health care.. We believe that a one size fits all approach is the wrong approach." "Every American ought to be insured, that ought to be done in the private sector, with private insurance, with government help." "What's going on in Washington is nuts. The prosperity we enjoy as a country is not because of government. It's because of free enterprise, and entrepreneurship and hard work." "Obviously health care is going to be the big issue when the Senate comes back in session. The governor has reminded me that this country is almost $12 trillion in debt. And set to go another $1.6 trillion a year for the next 10 years. I want to focus on what government spends its money on and how we can do it more efficiently." "If you heard me on the campaign trail or if you've been to any of my town hall meetings in the past, you've probably heard me say that I do not support a universal health care system in this country. I don't think the government should be running a health care system from a general standpoint." “We're at a real turning point in America regarding healthcare. I have real reservations about where we're going." "This is not an appropriate time for our government to adopt a comprehensive, whole-scale change in the health care system of the country." "You don't need to remake the whole system. And if you do you're going to scare a whole bunch of people. And you're going to move us to a European- style system that most people in this country don't want." Retiring Republican U.S. Sen. Jim Bunning received two standing ovations at a speech in which he called the Democratic plan for a single-payer, government-run health-care system a disaster. "I’ve been doing everything I can to stop this bill dead in it’s (sic) tracks. Will you help me keep up the fight against government-run health care with a quick and secure donation to my campaign?" "Let's get off timetables and timeframes, because they certainly don't work and they haven't worked." "I am however opposed to the bill that the House has produced, which not only wasn't bipartisan, but is enormously expensive." "I support reform that lowers health care costs, increases access and improves quality, but I cannot embrace a budget-busting government takeover of health care that forces millions off of the health care they currently have and empowers bureaucracy instead of patients and doctors." "The way it gets an advantage over the private system is it controls prices, and it puts a bureaucrat between you and your doctor, and it basically leads, inevitably, to a system like they have in England." "We're leaving to an elected official the ability at any point now, five years from now ten years from now, to write the rules on mandates in a way the private sector couldn't compete with the government option, that's just not a smart thing for the congress to do. It's ok if you want to have a government option but you've got to leave the private sector private." You know, this debate isn’t about health care. Health care’s the symptom. The debate is an uncontrolled federal government that’s going to run--50 percent of everything we’re spending this year we’re borrowing from the next generation. "The reason you're not going to have a government run health care pass the Senate is because it would be devastating for this country,"
"If we’re able to stop Obama on this it will be his Waterloo. It will break him." "You have to believe the government can do a better job of running health care. I don't." "And the second thing we thought we ought to point out the damage that a government-run program would do.... And I think we've been very successful with that.... I hope we've slowed down these unwise ideas that have come out. We haven't been as successful as I'd like us to be, so we're going to keep trying." “Any reforms must reduce costs and increase access - this will not be accomplished through a government takeover of our health care system." "…while 'there’s a lot of middle ground where we can meet, I don’t see how we can make much headway' unless the public insurance option is off the table entirely." “Right now, nearly 1.8 million Britons are waiting for hospital or outpatient treatments at any given time. Let's realize that the American voter will never stand for the kind of rationing by delay that seems to have crept into every other government-run health care system." 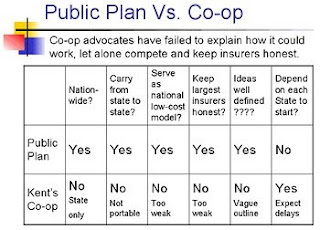 "A government plan though isn’t competition. A government is never a competitor, it is a predator." "U.S. Sen. Susan Collins, currently on a nine-day trip to the Middle East, has scheduled a number of community celebrations and a public forum when she returns, deputy press secretary Ian Swanberg said." Collins should have stayed home. The priority should have been, without doubt, was to work hard on health care for Maine citizens at this crucial time. Collins recognized the need in the past in this video featured on Collins Watch. Senator Collins talked about her desire for Congress to set aside two or three months to work on "virtually nothing but health care." I guess August in Augusta just is not one of those months. Just vote NO! We like the $tatus Quo! Death panel phobia is sweeping the country in the latest right wing fear ‘n smear campaign. We have a top Republican, Senator Grassely, who we are supposed trust as a contributor to a bipartisan solution, talking about the government possibly “pulling the plug on Grandma”. There is positive and rational end of life planning counseling in the house proposed plan and in no plan are there any euthanasia clauses. The bill language, which may likely and unfortunately be withdrawn now, actually aims to do the opposite of what the fear mongers exhort with whispers to screams. It seeks to clarify individual wishes and protect individual choices with the effect of not to passing on such matters to government decision making. It is a classic conservative/libertarian individual freedom protection. That is why when one looks at the initial placement of this concept in the bill it actually has Republican origins! Experience by others with health care review and “Medical Councils” in other industrialized countries do the exact opposite of what the fear mongers purport. Real experiences show better access to services result from medical reviews and that access to care rights are recognized and protected. Our existing death deciders do exactly what the fear mongers seem to be screaming about. Helpless people without fair consideration are being denied care and allowed to die. Now the right wing wants you to believe this will be your mother or even in wilder erroneous examples, Physicist Stephen Hawking or Senator Edward Kennedy who must have been writing legislation for years of a suicidal nature! In reality it the poor, homeless, and pre-existing condition victims of modest income that get death sentences imposed by affordability of care, denial of access, and health insurance transgressions. It is unfortunate that the rational truths that answer the lies being generated by the right wing receive little attention. Even more regrettable is that these boastful chest thumpers proclaiming that we have the best care in the world do not believe in this country’s creative ability to design an affordable and fair superior health care system free of the tyranny of private health care profits.